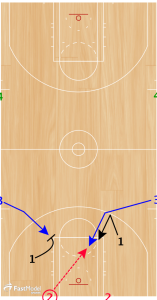 This drill came from Drew Hanlen. He is the Head Skills Coach for Pure Sweat Basketball. He has run his internationally renowned Elite Skills Clinics in over 30 states and 4 countries over the past four years. Team 1 plays live 2v2 against Team 2. Team 1 gets three passes to score. 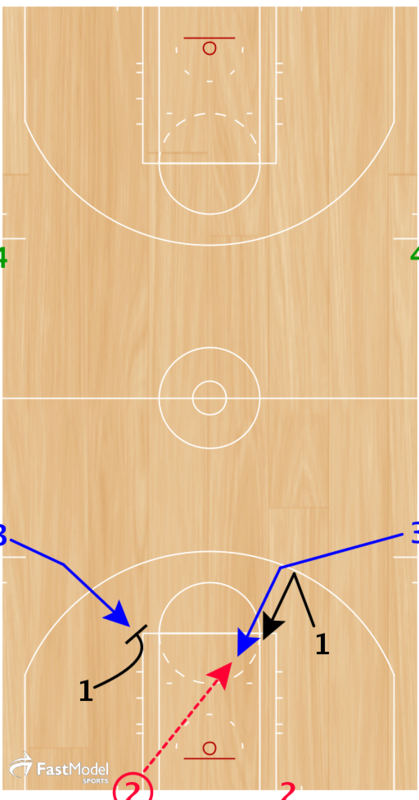 Players get three dribbles max each time they have possession of the ball. Team 2 takes the ball out, regardless if they get a stop or get scored on and inbounds the ball to Team 3, who will be face-guarded by Team 1. Team 3 must catch the ball in front of Team 1. No over-top passes. 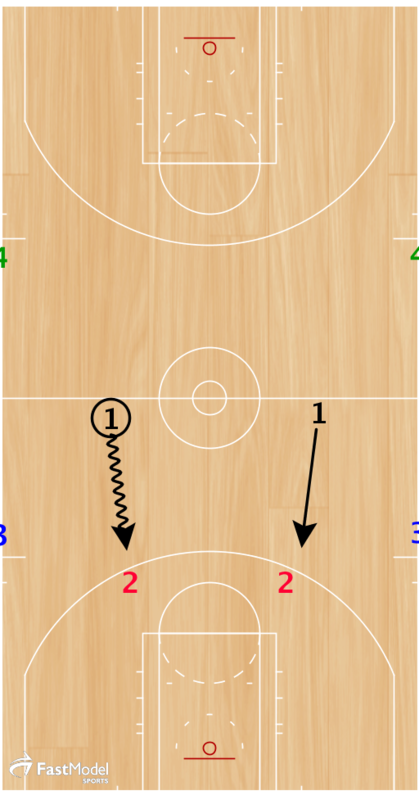 If Team 1 gets a steal on an inbounds pass or a 5 second call, they are awarded 5 points. 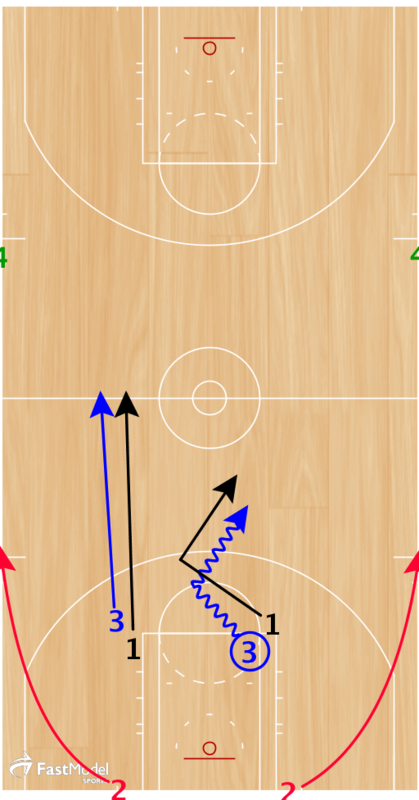 If they get a 5 second call, they get the ball and get to transition against Team 3, who loses their offensive possession. If they get a steal, they can try to covert against Team 3. If they score, Team 2 takes out the ball and again tries to inbound the ball to Team 3. If they get stopped, Team 3 just takes off and plays full-court 2v2 against Team 1. As soon as Team 3 successfully receives the inbounds pass (or stops Team 1 if they stole the inbounds pass and played live), they play full-court 2v2 against Team 1. 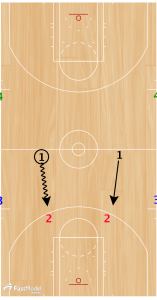 No over-top passes until the handler gets passed half-court. After Team 2 scores or gets stopped, Team 1 will inbounds the ball to Team 4, while Team 2 denies. Drill continues. 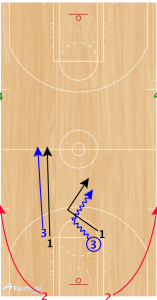 Continuous 2v2 full-court with inbounds denial. 2pts for a made 2pt FG, 3pts for a made 3pt FG, 5pts for a 5sec call or steal on an inbounds pass.